"Ooh, those booties look warm," I exclaimed. 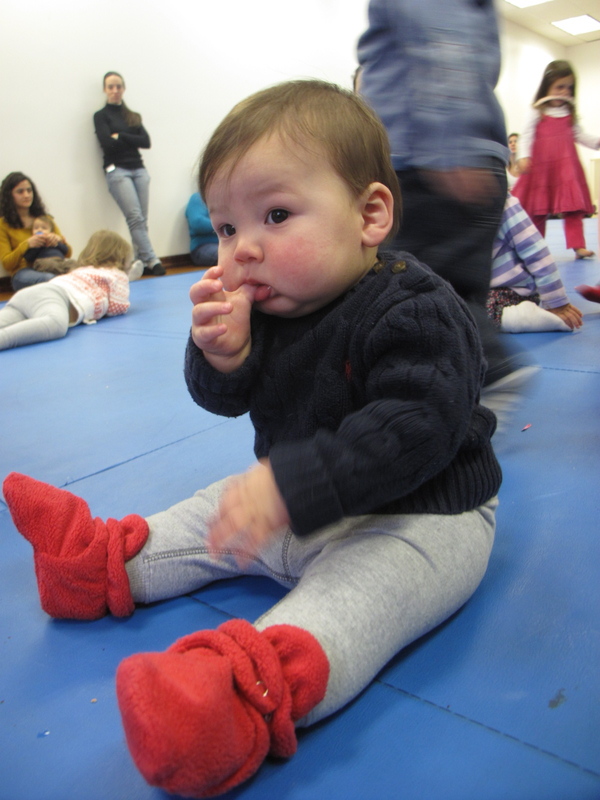 The woman sitting next to me at story time had her baby in some fleecy booties. "They're made by Zutano, they're super warm and they stay on her feet," she said. It's easy to slip the feet in because the mouth of the booties are huuuge! I googled Zutano fleece bootie when I got home and the first search result was Amazon's product page. Cool, the booties are eligible for free shipping if I buy something else that makes the total atleast $25. I found a roasting rack, something that's been on my list, and added it to the cart. When I went to check out, it said I owed $6.95 in shipping charges. Wait, what, why? Turns out the booties weren't free shipping. The page that led me to the product page said free shipping, but when you actually got to that page, it wasn't free. Well, I didn't want to pay $19.95 + $6.95 just for some little booties. And I couldn't find them anywhere else online without a big shipping charge. Local vs. Amazon after the jump! That's when I thought of buying the booties in my neighborhood. It's not that I don't love the idea of shopping locally to begin with, but I really try to spend my time wisely these days. Before Greyson, I could end up spending two or three hours hopping from store just to look for something. I just don't want to spend my time like that anymore. Yes, there are many baby stores in my neighborhood, but I had no idea who might carry the booties. I probably should have asked that woman in class where she got hers, but it didn't occur to me at the time. So, I looked on Zutano.com to see which stores carry their brand. Cool, there was a store that's a 15-minute walk away. It's not far, but why walk there to find out they don't have the booties. I'll just email them, I thought. (I would have called, but my searches tend to happen at 8 am or 10 pm, when I have some time to myself and when stores are closed.) I emailed the address that was on their homepage and got the below undeliverable message. Some independent store owners seem to love complaining about how customers are going to Amazon. And there's stuff to complain about, I bet. But, when some small stores can't even get their e-mail addresses right, how can they complain? I think local stores could do a lot more to market their businesses and take advantage of the Web, too. For instance, my brother who lives in Chicago just told me that he buys his shoes from DNA Footwear. I said, oh, I didn't know that little neighborhood shoe store was a chain. He said, it's not...he buys them online from the Brooklyn store. I don't know what that company is doing, but they probably aren't complaining about the internet. They're getting customers they wouldn't have had before. I was also curious to see if I got a response from Lulu's, another local store, if I emailed them asking if they carried the booties. An e-mail to their address bounced back, too! OK, so then I emailed Zutano directly (they like to tout that they are a family-owned company in Vermont) on their website, asking which stores near me carry their booties. They never got back to me. It's been two weeks. Finally, I just walked to Area Kids, the place closer to me that didn't have the correct email address on their own website. 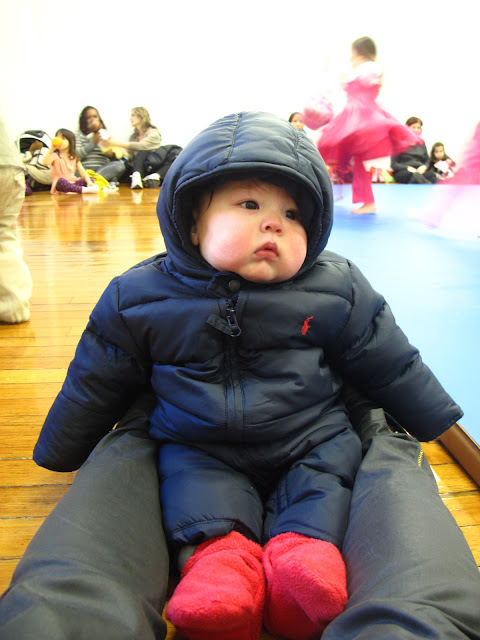 Fortunately, they had the 12-month size booties I wanted and they were already $1.50 cheaper than Amazon and I got a 10% Park Slope Parents discount on top and there was no tax because of the New York City clothing tax exemption. So, I was like, yay for shopping local (only when it's less expensive, right? I'm kidding, but not.). Shouldn't finding what you want locally be easier than what I went through? Every store owner that complains about Amazon should look at what their customers are facing when they want to buy something. It's not just about putting out a product and hoping people will find you. Well, at the end of the day I'm glad I got the booties, but I think local stores could have done a lot more to get me to look at their stores first. One step would be to have working e-mail addresses if you own a small store. And finally, I loove the booties! They go on the feet so easily, they stay on and they come in fun colors. I got the 12 to 18-month size even though Greyson is 7 months old, so that Greyson can keep using them for a while and even next winter. 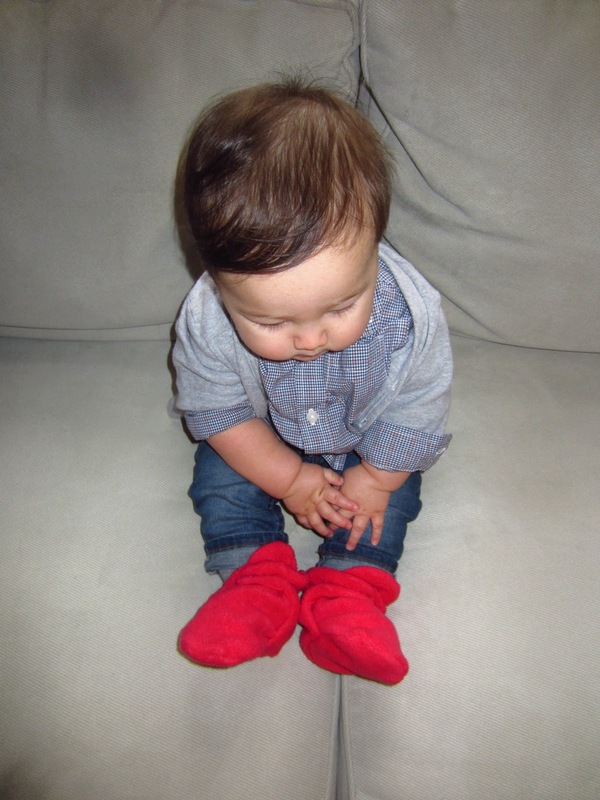 We love our Zutano booties! I had never seen them until a couple of weeks ago! I think they are a must-have.